I first wrote this article, originally entitled, Run Ragged, for Calgary’s Child Magazine a few years ago. But I thought it would be a good blog to post for the Mothering Matters campaign because this is such a busy time of year for families re school and sports wrapping up (hopefully). So I gave the article a new title and asked Kristin, the person interviewed, if she would answer a couple more questions now that her kids are a bit older. She said yes! I first met my friend Kristin on the soccer field when we were in grade eight, so we’ve been friends for well over three decades. She is married and a stay-at-home mom of three children aged eleven, nine and six. I’m single and don’t have kids – and must confess to being morbidly curious as to how the heck she manages her life. So we went for a beer and I fired some questions at her, starting with asking for a play by play of how she spent her average weekday and weekend. By the end of that answer, my head was spinning. However, since the majority of readers are parents themselves, I won’t share the gory details – but suffice to say, they would come as no surprise to other parents. Then I continued with my questions. Q: What words would you use to describe your life right now? A: Fulfilled. Busy. Fun. Happy. Jumbled. Q: And where is time for YOU in all that? A: There isn’t much. I try and take 15 minutes a day to eat lunch and maybe read a magazine. It’s just that in my mind, there is always stuff that needs to be done…it’s an endless list of chores that need to be tackled on a regular basis: garbage, recycling, picking up dog poop, laundry, shoveling the walk or mowing the lawn, doing the dishes, making meals and so on. Now there is never a period of time in my day that I have more than an hour to devote to everyday chores. I’m getting less stressed about this. It used to be that if I didn’t have less than a two-hour chunk of time to complete a task, I wouldn’t do it. But then everything got really backed-up, so I’m much better now at managing my time and prioritizing chores. I do what makes me feel better. I’m not stressing over things as much anymore. It doesn’t have to be perfect. Things are different at home right now because my husband is working two full time jobs – and one of those is his own business. So it’s not the normal routine for us. The one thing I try to do for myself is to go to my weekly Pilates class – but I missed a lot last fall. This bothers me because it’s ONE hour per week and yet it often gets squeezed out because something else comes up that has to get done. Q: What are the challenges of raising a family for you? The main challenge is finding the quality time that we had when the kids were younger. It’s tough to make time for activities like tobogganing, going to movies and playing games because all the scheduled activities take up time. Then, next in the line of priorities is usually the house-keeping and all the regular maintenance tasks that need to get done. So the fun family stuff is really hard to make time for – and I feel guilty about that. Organized sports take so much time, there’s not much time left for kids just to be kids…going for bike rides and so on. Q: Is your life what you thought it would be, raising three children? A: I thoroughly enjoy being a mom but I did not think it would be this busy, with such little free time. When the kids were smaller, it was busy but I had time. Now I have no time for me. I’m not resentful because I see how much the kids enjoy the sports but I would like more time for myself. And I know I need it when I find myself getting frustrated with the kids because I’m tired. Q: How is raising a family today different than when you were a kid? I think the big difference is that we were lot a more independent and did things on our own more. I’m not sure if it is a real or perceived threat about kids’ safety but as parents, we do much more for our kids and baby them a lot longer by driving them or walking them to school, etc. And regarding organized sports, when we were kids we could walk to fields and facilities ourselves. But because there is such a lack of facilities close by now, parents have to drive the kids everywhere. Q: How do you handle all the demands placed upon your time? I have learned to accept that by putting kids into sports, this is how it is going to be. I’ve also learned not to look too far forward, unless I’m going to need some outside help to make it all happen. I try to only look two days out, otherwise it’s too overwhelming. I used to get really worked up ahead of time knowing all that needed to be done and then I’d take that stressed-out attitude into the day. I’ve had an attitude shift and that has made all the difference. Q: When did your schedule change from manageable to not so manageable? Last fall when my husband started his own business on top of his regular full time job – so this is a bit of an unusual stage for us. I am basically a single mom. The other factor that really changed the family schedule was when all three kids got into activities. Then life got really busy. Now that all three are in activities and each activity requires two to three time commitments per week, that’s nine activities that need to fit into evenings and weekends – plus birthday parties. Q: What would you change about your life to make it more manageable? I would like more time with myself. I want to be able to place less priority on the maintenance of the house and just mentally let go of all that needs to be done. I want to place more emphasis on hanging-out time…be able to say “Forget the house, let’s go for a bikeride!” I’d like to live more for the moment versus the future. Q: Would you say your life is balanced? Not right now, no. It’s more about the kids than me. Q: What are the age of your kids now? Q: I know you put an awful lot of time and energy working with your husband to run the family business. Do you have any tips for other people who are trying to juggle raising children and running their own business? A: Hmm – based on how I am managing things I’m not sure I am qualified to give any tips! You have to find a balance so everyone and everything can get taken care of but that is easier said than done. When you own a business there are pros and cons – there are days when things are slow so I don’t have to work a full day – however there have been times when I work 10 – 12 hour days. Trying not to let this interfere with home and children can be tough. These are the days the housework and stuff gets put on the backburner so you have to make up for this on the slower days. Unfortunately all this doesn’t leave a lot of “me” time! Q: Now that your kids are a bit older, do you find you have more time for yourself? Or are you just as busy as before…if not busier? A: My kids are older now but because I work outside the home I feel I am busier right now than I have ever been. I was fortunate to be a stay at home mom when my kids were younger (and loved it!) but juggling work with kids is tough! Even though my kids are more independent in some ways, now that they are older their activities are that much more involved and more intense so a lot more hours per week are needed to drive them to their sports and other activities. Also feeding them – the schedules are all over the place so we rarely ever sit down together as a family for a meal and I seem to be constantly running to the grocery store to replenish and supply food to keep them going! If I was organized I wouldn’t be running to the store all the time but I can’t seem to get that working for me. I have a hard time thinking of meals because everyone is off in different directions. All of this leads for not much time for me. I had a really busy winter with our business and had a few meltdowns and realized I had to fit in some time for me or I was gonna lose it. I have taken efforts to make time to do some reading again, which I love to do but wasn’t allowing myself to do. I find myself waiting in a car quite often for one of my kids to start or finish one of their sports so I will use this time to catch up on a book…gotta find the time when and wherever you can! Q: For you, what is the most rewarding thing about being a Mom? A: I love watching my kids grow, mature and enjoy themselves in their respective sports and activities and hanging out and having fun with them! Q: What is the most challenging thing? A: Finding that inner place where you can say to heck with the housework and lets just go have fun and hang out, even though no one has clean clothes and the bathrooms are disgusting! I am learning to not care as much about that stuff but I must admit it still stresses me sometimes. I do not begrudge being busy with my kids – it’s the work and housework that gets to me. Q: Would you say that your life is more balanced than it was when I first interviewed you? A: I think I have actually learned to chill out more and I don’t stress over the small things in life as much, so I feel more balanced. I’m good with the way things are! Q: Do you think a balanced life, with kids still at home, is even possible? A: Yes I do – I think balance can come with one’s perspective and how you look at things. I know soon enough my kids will be adults themselves and I will have more time to myself – and I’m pretty sure I’m going to miss the craziness. The Mothering Matters blog series is a forum in which the motherhood decision is explored and the challenges and responsibilities of motherhood and mothering are discussed, so that we can learn from one another – whether we are raising children ourselves or not – as we move forward together to a healthier future for all. To read other Mothering Matters blogs or to subscribe to receive the weekly e-mails, please here is the link. Maryanne, thanks for a very honest post. I agree all the stages of raising kids at every stage is hard, takes time and energy. Mine really rebelled a bit when I stated looking after my Dad and mom. But I think they understand more now. Hi Joyce…it certainly sounds like a very busy stage indeed – especially when there are other work & family commitments, going on. 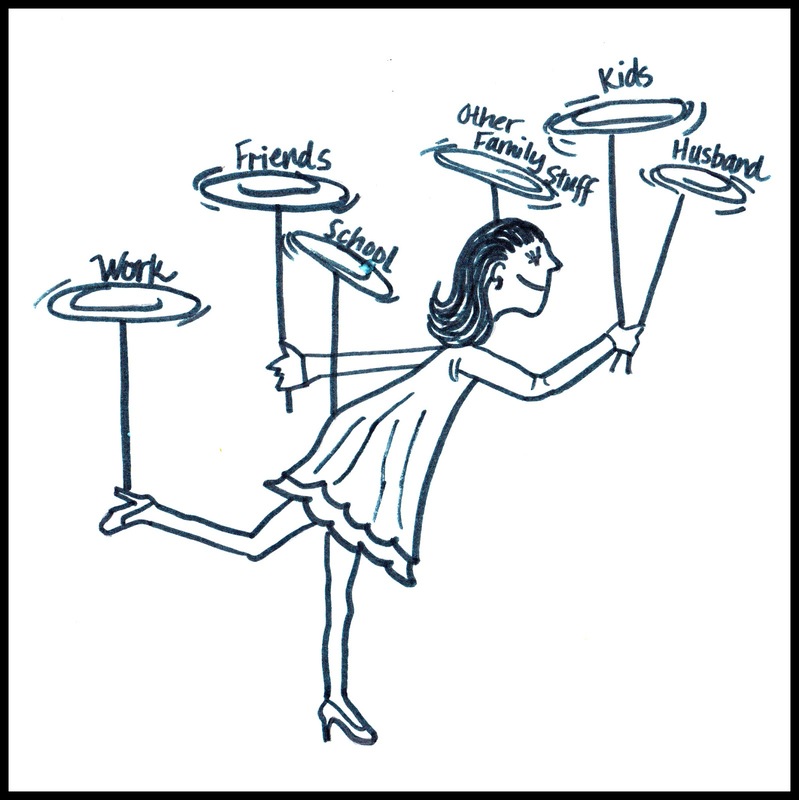 Juggling all the responsibilities can be a challenge, I bet. You raise a good point about your own kids being rebellious when you had to devote more time to helping out your own parents more. It is a very fine balance, I’m sure…and tough to get just right! Kristin sounds like she’s in a very similar environment as I am. Finding the balance is key and just accepting that ok, your house can get messy or the wall that needs painting will wait!